Orbital ATK has unveiled a practical new proposal to build a near term man-tended outpost in lunar orbit that could launch by 2020 and be operational in time for a lunar link-up with NASA’s Orion crew module during its maiden mission, when American astronauts finally return to the Moon’s vicinity in 2021 – thus advancing America’s next giant leap in human exploration of deep space. The intrepid offer by Orbital could be carried out rather quickly because it utilizes an evolved version of the company’s already proven commercial Cygnus space station resupply freighter as “the building block … in cislunar space,” said Frank DeMauro, Orbital ATK Vice President for Human Spaceflight Systems, in an exclusive interview with Universe Today. See an artist concept in the lead image. “Our Cygnus spacecraft is the building block to become a vehicle for exploration beyond low Earth orbit,” Orbital ATK’s Frank DeMauro told Universe Today. NASA’s agency wide goal is to send astronauts on a ‘Journey to Mars’ in the 2030s – and expeditions to cislunar space in the 2020s serve as the vital ‘proving ground’ to fully develop, test out and validate the robustness of crucial technologies upon which the astronauts lives will depend on later Red Planet missions lasting some 2 to 3 years. 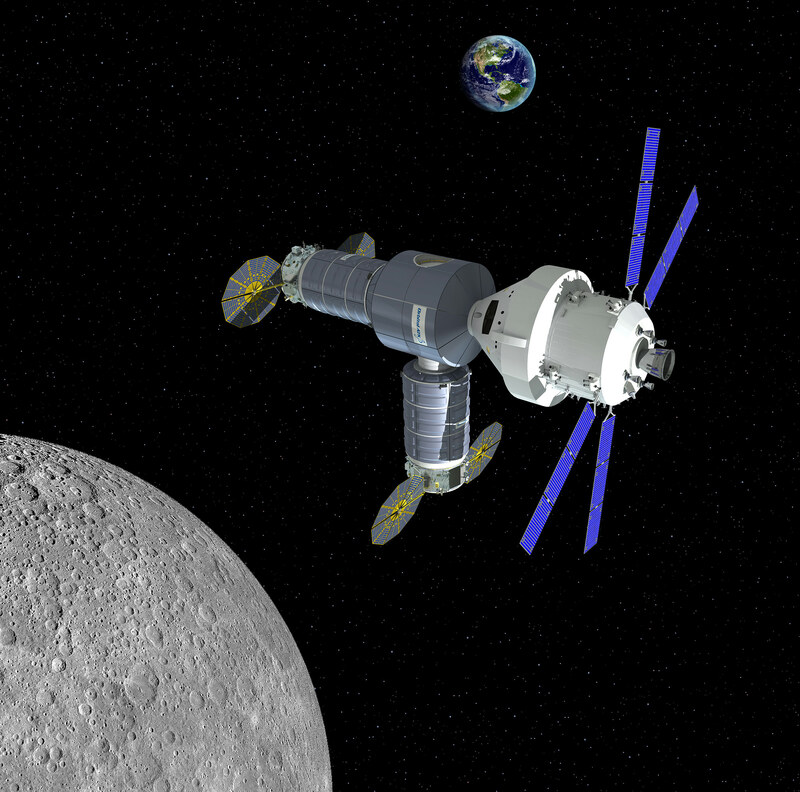 Orbital ATK’s lunar-orbit outpost proposal was announced at an official hearing of the US House of Representatives Subcommittee on Space on Wednesday, May 18, by former NASA Astronaut and Orbital ATK President of the Space Systems Group, Frank Culbertson. “A lunar-orbit habitat will extend America’s leadership in space to the cislunar domain,” said Orbital ATK President of the Space Systems Group, Frank Culbertson. The idea is to assemble an initial crew-tended habitat with pressurized work and living volume for the astronauts based on a Cygnus derived vehicle, and have it pre-positioned and functioning in lunar-orbit by 2020. As envisioned by Orbital ATK, the habitat would be visited during NASA’s first manned mission of SLS and Orion to the Moon known as Exploration Mission-2 (EM-2). The three week long EM-2 lunar test flight could launch as early as August 2021 – if sufficient funding is available. The goals of EM-2 and following missions could be significantly broadened via docking with a lunar outpost. And Orion mission durations could be extended to 60 days. NASA hopes to achieve a launch cadence for Orion/SLS of perhaps once per year. Therefore autonomy and crew tended capability has to be built in to the lunar habitat right from the start – since crew visits would account for only a fraction of its time but enable vastly expanded science and exploration capabilities. The initial lunar habitat envisioned by Orbital ATK would be comprised of two upgraded Cygnus pressurized vehicles – provisionally dubbed as Exploration Augmentation Modules (EAM). They would be attached to a multi-port docking module very similar in concept and design to the docking Nodes already flying in orbit as integral components of the ISS. The lunar Cygnus vehicles would be upgraded from the enhanced cargo ships currently being manufactured and launched to the ISS. “There are additional capabilities that we can put into the Cygnus module. We can make them longer and bigger so they can carry more logistics and carry more science,” DeMauro elaborated. A variety of supplementary subsystems would also need to be enhanced. “All that work is getting looked at now – to determine what we need to modify and upgrade and how we would do all that work,” DaMauro told me. The habitat components would be launched to the Moon on a commercial launch vehicle. High on the list of candidate launchers would be the United Launch Alliance Atlas V rocket which recently already successfully delivered two Cygnus cargo ships to the ISS in Dec. 2015 and March 2016. Other potential boosters include the ULA Delta IV and even ESA’s Ariane V as a way to potentially include international participation. The habitat components could be manufactured and launched about three years after getting a ‘Go Ahead’ contract from NASA. Orbital ATK already has an established production line flowing to manufacture a steady stream of Cygnus cargo freighters to fulfill their NASA commercial resupply contract with NASA for the ISS – accumulating know how and cost reduction efficiencies. “Since many aspects of operations in deep space are as yet untested, confidence must be developed through repeated flights to, and relatively long-duration missions in, cislunar space,” says Culbertson. Over time, the outpost could be expanded with additional habitat and research modules delivered by Orion/SLS, commercial or international rockets. Perhaps even Bigelow expandable commercial modules could be added later. Cygnus is suitable for wide ranging science experiments and gear. It could also launch cubesats – like the current Cygnus berthed at the ISS is equipped with a cubesat deployer. Potential lunar landers developed by international partners could dock at the cislunar habitats open docking ports in between surface science forays. “We are doing science now on Cygnus and we would expect to carry along science experiments on the new Cygnus vehicle. The vehicle is very attractive to science experiments,” DeMauro explained. “What we put out is very exciting,” DeMauro noted. By incorporating commercial companies and leveraging the considerable technology development lessons learned from Cygnus, NASA should realize significant cost savings in implementing its human exploration strategy. Although Orbital ATK is not divulging a cost estimate for the lunar habitat at this time, the cost savings from a commercial partner should be considerable. And the 3 year time frame to launch is very attractive. Orion is designed to send astronauts deeper into space than ever before, including missions to the Moon, asteroids and the Red Planet. Cygnus derived modules and/or other augmenting hardware components will be required to carry out any round trip human missions to the Martian surface. NASA is now building the next Orion capsule at the Kennedy Space Center. It will launch unpiloted atop the first SLS rocket in late 2018 on the EM-1 mission.